One of the best lessons that any college or university business instructor ever told me was to surround myself with experts. Nobody can be an expert at everything. Any business owner who thinks he or she can be an expert in everything in their business is setting themselves up for problems. Sometimes “do-it-yourself” solutions can be more costly than hiring a real expert that is focused on just that one job. 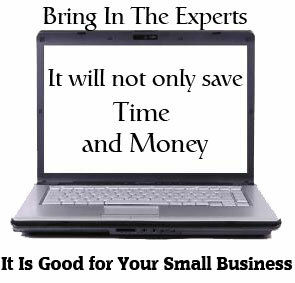 Hiring the right experts to do the right job is key to the success of a small business. When small businesses need legal or financial help, they hire lawyers and accountants because they know these professionals have studied in their respect fields extensively. Similarly, small business owners want to become the known experts in their field of business. When small businesses try to do some things like SEO (Search Engine Optimization) on their own, they often fall behind on the changes that are constantly being made to the search algorithms, or the policies and intentions of the search engines. Sometimes do-it-yourself SEO solutions can not only be out of date and no longer work, but they may also fall on the bad side of acceptable practices set down by the search engines – and actually gain negative effects or even get their site banned! Some small businesses that cannot justify hiring a full-time office manager for their commercial office space still try to do the job themselves. Taking on the role of office manager, they often have to deal with photocopier supplies and maintenance, managing telephone system leases and Internet and IT problems. Meanwhile, this takes time away from focusing on their core business activities and client management. Smart small business owners have discovered that having an office in a business centre eliminates most of the office management tasks – and allows them to focus not only on their core business activities, but also on acquiring new customers. Even the job of creating and editing content and social media activities are tasks that small businesses are learning to outsource. Using a professional in creating copy and understanding the best way to use social media, will increase the impact of a message and deliver it to the right audience.